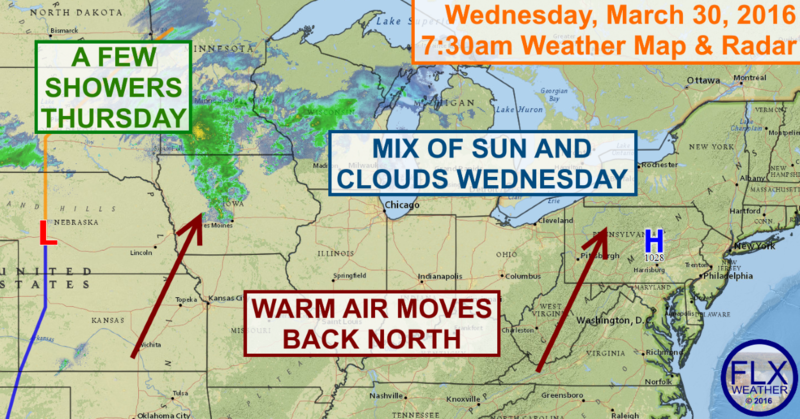 Southerly winds between high pressure over the East and low pressure developing over the Midwest will pump warm air back towards the Finger Lakes. This high pressure system kept skies clear last night, letting temperatures drop well back into the 20s. Some sun, along with the southerly winds, will help temperatures rebound nicely by this afternoon, with highs in the mid 50s. Along with the sun will be some patches of clouds, especially later in the day. No precipitation is expected today though, and winds should remain very light. Clouds will continue to thicken overnight, and a shower or two may drift through the region. Warm air will continue to build in, with temperatures only dropping into the mid and upper 40s overnight. Thursday will be mostly cloudy with a few showers, especially for norther and western areas. The south wind will significantly strengthen on Thursday, with some wind gusts approaching 40 mph. Temperatures should soar into the low and mid 60s, especially if any sun manages to break out. Rain showers will become more likely in the evening hours, and again early Friday morning. Temperatures should remain in the low 60s on Friday, with highs around 50 degrees on Saturday with some more showers. The system moving through on Saturday will usher in a shocking pattern change. Cold air will rush in behind this system, changing rain to snow by Saturday night. While still uncertain, several inches of snow may even up falling by Sunday morning. High temperatures on Sunday will struggle to reach 30 degrees. Monday and Tuesday could end up similar, with at least an outside chance for more accumulating snow. Stay tuned.